I had a vision a few years ago, while in a Kundalini yoga class. It wasn’t like an other-wordly revelation or anything, just an image that came into my head as we were in the meditation portion of the class. It was an image that simultaneously felt so profoundly truthful, while making little logical sense. I was moved to write a letter to Dr. Christine Blasey Ford during her testimony and subsequent questioning, on Thursday, September 26, 2018. I wrote this letter after she left the hearing, in the early afternoon, and sent it to her, in care of her lawyer. I am so glad that I wrote this before I saw the second half of the hearing — because it’s a capsule in time of what I felt after seeing her part of the day. Things certainly shifted after that, and have many times since. Friday night, September 28th, I pulled together a Solidarity Gathering at South Church in Portsmouth, NH. I was compelled to hold space for everyone feeling like they needed community. Only a few people showed up, but many more expressed gratitude for knowing that it was happening at all. It felt important, urgent. It was totally necessary for me. We lit candles, we shared our stories, we shared our feelings, we talked about how we could change our culture from perpetuating the dangerous circumstances that make situations like these all too common. It was healing. 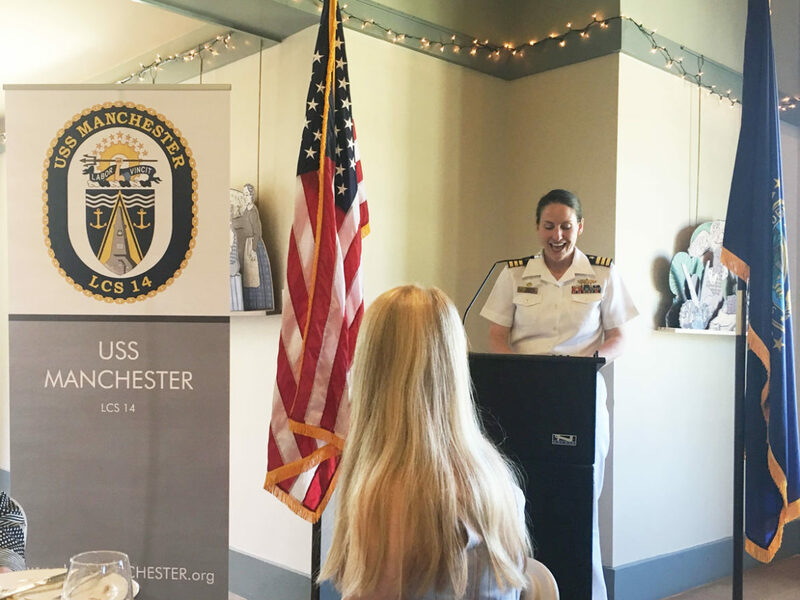 Commander Emily Bassett of the soon-to-be commissioned USS Manchester, was honored at the Women in Leadership: Next Generation luncheon at Strawbery Banke. Manchester Mayor Joyce Craig was also a guest of honor, and the two both shared inspiring words to the local women leaders and their young women guests at the TYCO Visitor’s Center today. I was grateful to be at this lunch along with local leaders including city councilors, city officials, business leaders and representatives of the Shaheen family. (More on the Shaheen family’s connection to the USS Manchester here). She used this simple yet powerful 4-step practice when the USS Manchester was entering the Piscataqua River on Monday. The plan was to welcome aboard the Senator and her family, and the Governor and his family, by meeting the a smaller boat on the river and having them climb the ladder to get on deck. While navigating into the Piscataqua River with our world-famous powerful current, Commander Bassett reached Step 2: Envision Success, and got stuck. In her TED Talk, “The danger of the single story,” Chimamanda Ngozi Adichie warns that knowing only one story about people different from you can result in a vast misunderstanding. A single story can never be representative of the entire group that the subject of the story represents. The power of stories is that they show one possibility. That possibility, if it resonates with beliefs we already have, is very motivating – for better or worse. “Single stories create stereotypes. And the problem with stereotypes is not that they are untrue, but that they are incomplete.” Allowing single stories to speak for the identity of a vast group of people is, to say the least, problematic. But that doesn’t mean stories themselves are the culprit. Adichie goes on to say, “Stories matter. And many stories matter.” Our job is not to stop telling stories, it’s to stop repeating the same tired stories, listen to new stories from others and start telling our own. What does all this talk of stories have to do with guns? If you’re a business or nonprofit with a social mission, and you’re looking for some help managing your online presence, we just might be a perfect match. Content management is managing (editing, publishing, updating, rearranging, freshening up) your content (blog posts, web pages, photos, videos, infographics, memes, sidebars, menu items, forms, etc.) to help you reach more people more effectively online. Content management is not a thing that non-techie folks are necessarily able to learn intuitively — and even if you are able to add or edit blog posts, you may not know enough about user experience (UX) or search engine optimization (SEO) best practices. That’s where a content manager — like me — comes in. Okay, what’s WordPress content management? “WordPress content management” simply means editing, updating and maintaining your website on the WordPress platform. Not sure if your website is on WordPress already? Well, since WordPress is still the most widely-used content management system (or CMS) out there, chances are good that your website is on it. Why WordPress content management for socially-responsible businesses? I care about helping teams that are working to create better communities. Many socially-responsible businesses and organizations have service providing as a top priority, but their digital /online presence might be taking a back seat. I’ve written before about how search engine optimization is community engagement optimization. If people can’t find you online, they can’t advance your mission. A robust communications strategy is really important. And, a fair amount of communications strategy can be demonstrated with a really clear website content strategy — and that includes everything from menu structure to clear and compelling calls-to-action. Therefore, providing WordPress content management for socially-responsible businesses is critical to building better communities. So, should we work together? If you’ve ever worked with me before, you know about my commitment to working with socially-responsible, values-aligned organizations and businesses — aka values-centric work. If you’ve seen my Services page, you’ve seen the list of the types of organizations and businesses I will and won’t work with. Socially responsible is a category that encompasses many attributes that my favorite clients share. So, if you’re part of a socially-responsible business or organization in need of some WordPress content management assistance, I’d love to talk. Since I work freelance, I can typically offer rates lower than agencies — and if all you need is content management (organization, re-organization or optimization of your existing site), you likely don’t need a pricey agency anyway. Drop me a line, and I’d be happy to give you a free assessment, take a walk outside with you or grab a beverage and talk about your communications and marketing goals and whether I’d be a good fit to help you achieve them. Tipping promotes inequality, and fosters discrimination and sexual harassment. The roots of tipping in the US can be traced back to the freeing of slaves, when change-resistant employers could avoid paying freed slaves an actual wage by making them work for tips. People who work for tips are twice as likely to live in poverty, and can be paid far below minimum wage. People of color are tipped at lower rates than their white colleagues. Workers who rely on tips to make a living experience twice as much sexual harassment. Is this what we meant when we used to say, “Here — for your trouble”? New Hampshire’s fetal personhood bill is expected to become the latest example of what those who have been following New Hampshire’s reproductive rights policies already know: Governor Sununu consistently steps on women’s bodies to rise in his own political career.